It is a storage place for Test objects (and other Objects)What is Test Object? Two types of object Repositories in UFT. 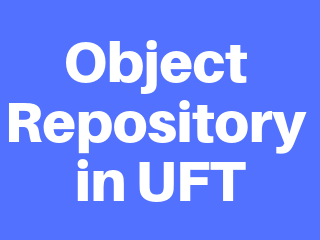 UFT creates a Local Repository for every Action during Recording, UFT maintains Local Object Repositories. Local Object Repositories are saved along with the Test Script. User creates Shared Object Repositories either by Adding objects or by exporting local objects. Shared Object Repositories are external files, user has to maintain these files. User (Tester) can edit Shared Objects.